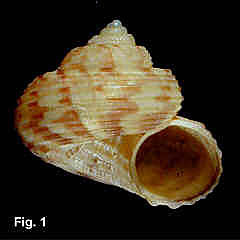 Description: Shell width about equal to height. Sculptured with primary and secondary spiral ribs; about 10 primaries on body whorl, uppermost beaded, remainder smooth; 1-5 secondaries between each primary. 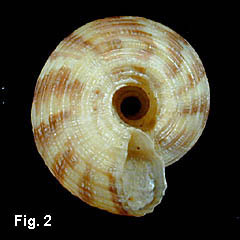 Area above upper primary rib flat, sometimes axially ribbed; remainder of whorls rounded. Axial lamellae absent. Base with whorls rounded. Umbilicus open, extending to apex, bordered by beaded ribs descending into umbilicus. Aperture circular; outer lip smooth within. Colour white with irregular axial streaks of purple-brown, extending onto base. Aperture white. Interior nacreous. Size: Up to 12 mm high, 11 mm wide. Distribution: Endemic to Australia; Cape Moreton, Qld, to Bass Strait, Vic. Habitat: Known from 15-550 m. Common. Comparison: Distinguished within the genera Minolia and Spectamen by the numerous strong spiral ribs. Remarks: Minolia gertruda (Iredale, 1936), known only from the holotype, is similar in sculpture and colouration to M. arata, but with width much greater than height (holotype width 10 mm, height 6.5 mm).